WASHINGTON, D.C. -- About as many Americans say the news media have been too tough on Donald Trump (35%) as say the news media have not been tough enough (34%), amid the president's public battle with the media. This is similar to March, when Americans were also about split in their evaluations. An additional 28% say the news media's coverage of Trump is "about right." Slightly more Americans today than shortly after President Trump's inauguration in January (28%) say the media are not being tough enough on Trump. The percentages saying the coverage was "too tough" or "about right" were roughly the same as they are now. The media's coverage of Trump has been a major story since he took office. The president has referred to segments of the news media as an "enemy of the people" and "fake news." But even as Trump's clashes with the media continue, Americans' views of the way media have treated Trump seem mostly fixed. Public opinion held steady after new developments such as the recent Twitter conflict between Trump and "Morning Joe" co-hosts Mika Brzezinski and Joe Scarborough. In that exchange, President Trump called attention to Brzezinski's physical appearance and made assertions about Scarborough's mental state. The "Morning Joe" hosts responded, "Donald Trump is not well" in a Washington Post column. Republicans and Democrats hold diverging beliefs about how the news media are treating Trump. 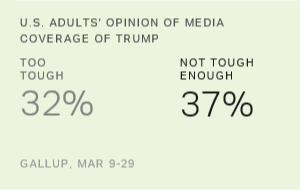 Seventy-seven percent of Republicans say the media have been too tough on him, up from 64% in March. However, the shift was not enough to move the overall number much, particularly as independents' and Democrats' views haven't changed. On the other end of the spectrum, 53% of Democrats say the media have not been tough enough on Trump, though the percentage of Democrats who say "about right" is up 11 points to 38% from March. Gallup also asked Americans who they side with in disputes between Trump and the media. Currently, 36% say they lean toward or strongly side with the news media, while 32% side either moderately or strongly with the president. In these disputes, in general, do you -- [ROTATED: strongly side with Trump, lean toward Trump, side with neither Trump nor the media, lean toward the media (or) strongly side with the media]? About three in 10 U.S. adults agree with neither side. These data are virtually unchanged from March, suggesting that the lines have been drawn in this battle. Forty-eight percent of Republicans strongly side with Trump, while 3% of Democrats are firmly on the side of the president. On the other end, 32% of Democrats strongly side with the media, and 3% of Republicans say the same. In the months since January, it is obvious that Americans are paying relatively close attention to the matter. In the U.S., 74% say they are following this Trump-media conflict very or somewhat closely. This is virtually unchanged from March. Trump has become a lightning rod for media scrutiny since he announced his campaign for president, and that has continued now that he is in office. Public opinion appears to be settling into a roughly even split between those who sympathize with Trump and those who take the media's side. The last time Gallup asked about perceived media toughness prior to Trump was shortly after Barack Obama's inauguration in 2009. Then, 48% said that the coverage was "about right" and 38% said "not tough enough." Only 11% said "too tough," suggesting that Americans' perceptions about the media coverage of the Obama presidency, albeit in its early stages, were quite different from today. With Republicans believing the media are too harsh toward Trump -- and Democrats saying the media aren't harsh enough -- these familiar partisan lines are likely to persist as this presidency continues. 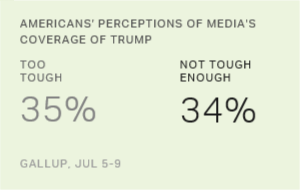 Perhaps a sign of the media's dilemma regarding how to cover Trump, the percentage saying the media's coverage of him is "about right" has not reached a majority across the three surveys Gallup has conducted.